The world has advanced in several aspects, including in mountain bikes. Electric mountain bikes have hit the market and are the newest trend as they make cycling a better and smoother experience. 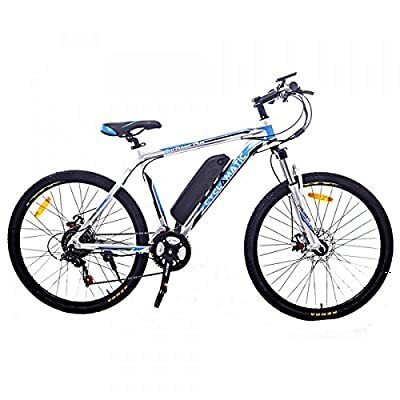 Electric mountain bikes are powered with a motor and run on a rechargeable battery. They provide different speeds according to the model of the bike and per recharge can offer a certain amount of distance. The amazing evolution of bikes is new and is a little tricky to figure out. Our guide will help you find the best electric mountain bike of 2019. Our detailed buying guide helps you in understanding the most important aspects to focus on. 2.4 4. How Much Suspension Travel Does an Electric Mountain Bike Need? The Ancheer has a lithium battery that helps in running its high-speed motor. The battery is charged to easily go up to 50 km/s. There are two modes to choose, the workout mode or the riding mode. Users can also select both the options for an effective workout experience. The frame of this bike is made of aluminum alloy. The frontal fork is made with carbon steel and has the ability to absorb shock. The wheels of the bike are heavy duty and are made with aluminum alloy. There is a brake and gear shift system to help you manage your riding and speed. This electronic mountain bike also has a LED system which makes it perfect for night riding. The adjustable seat and the weight capacity goes up to 150kg allowing the bike to be suited for different weights and sizes. The Cyclamatic is the epitome of a great bike. It has a comfortable padded seat so that you can ride for a long time without being in pain. The electricity is provided through a lithium-ion battery that provides a speed of 15.5 mph maximum. A full battery charge can provide the user with up to 37 miles. The Kenda tires are suitable to be used during rain as well, which makes the bike safe for using in slippery terrains. 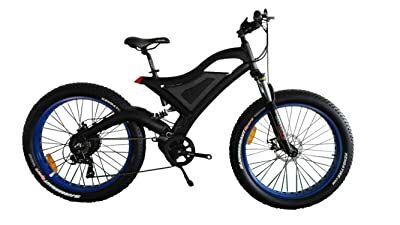 This electric mountain bike has nine levels of pedal assistance; low, medium, and high levels which can be chosen on the handlebar. The front wheel is a quick release so that the bike can easily compress for storage and for transportation. This electric bike can hold up to 220 lbs. of weight and can be used by children 14 and above with ease. The Kenda tires are perfect for all sorts of terrain, including the slippery ones. The lithium-ion battery can give up to 15.5 mph speed and about 31-37 miles on a full charge. There are nine levels of assistance that can be easily selected on the handle. The saddle is very comfortable and suitable for long rides without causing pain. There is no night light to ride in the dark. 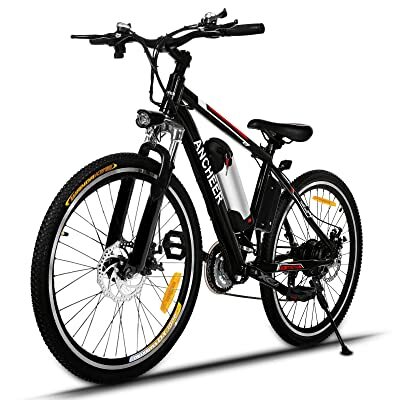 The Ecotric is an electric bike with a rear hub motor of 500W to make it one of the most powerful bikes in the market. The tires are thicker than usual which makes them the highlight of the bike. They are perfect for any weather condition and any terrain. On a full charge of the lithium-ion battery, you can enjoy up to 20 mph of speed. The rear disc brakes allow the bike to be more reliable. The material of the frame is aluminum which makes the bike heavy duty and durable. This electric bike can hold up to 260 lbs. and comes pre-assembled allowing users to enjoy the safety of assembly. There are three-speed levels which go along with paddle assist and there is also a small storage box with a lock attached to the bike. The bike has fat tires that are suitable for all sorts of terrain. On a full charge, you can enjoy up to 20 mph of speed. The frame of the bike is heavy duty aluminum. Up to 260 lbs. of weight can be accommodated on the bike. There is no night light on this bike which makes it unsuitable to ride in the dark. The seat cannot be adjusted which makes it a little difficult for shorter people. The Bafang has fat tires that make the bike highly suitable for rough terrain. The lithium-ion battery is from one of the most trusted companies around the world; Samsung. On a full charge, this battery is able to provide about 70 km of distance and 35 km/h speed. The bike comes partially assembled and the rest is very easily described in the manual. The intelligent paddle assist system allows you to have speed control options of the paddle that is easily changeable. The Kenda tires are one of the most trusted tires in the bicycle industry making this bike better than many other similar options. The LCD display in this bike has a backlight as well so that you can see even when it is dark. The disc brake system allows easy and smooth breaking for safety and stability. Kenda tires are used on this bike and are suitable for almost any terrain. The lithium-ion battery is made by Samsung which makes it trusted. A full charge gives the battery about 35 km/h speed and 70 km of distance. The intelligent paddle assist allows you to adjust to the speed of the paddles as you prefer. The bike does not have an adjustable seat for people of various heights. There may be a need of professional tuning of the bike when it is unboxed. The product’s value and price comes down to its quality and workability. 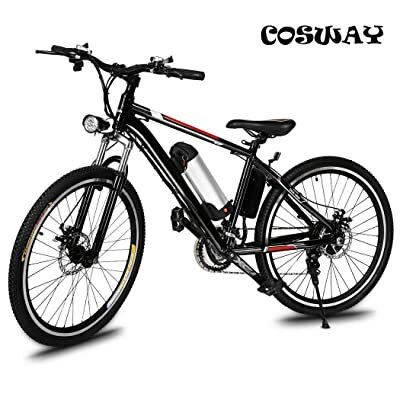 The Cosway speed electric bike is designed and constructed for mountain rides. It is constructed with very light aluminum, which also works as a rust resistant when coated with paint. Its structure is strong and durable. The function of the breaks and gears are very safe for use in high range area. To make the speed mode easier for you, they have placed a 3-speed meter button with two working modes. The best part here is that one can ride up to 60 km on one fully charged battery. Its design is made especially for mountain rides so that it is not very heavy and easy to ride. Its partial assist mode helps people who want to experience the ride high-lows or to save the battery charge. To have all safety precautions, the manufacturers have placed a horn, a water-bottle carrier and a LED light for night vision. The battery Lithium Ion used is the best and is commonly used. The battery life is long and can take one person up to 60 km in high range areas. It comes with safety equipment: LED light, horn, and a water-bottle carrier. The gears and tires are anti-slip. The seat is made adjustable for comfort. The construction is durable and strong. It is made anti-resistant and all-weather friendly. The battery life can be a downfall if used for continuously on only battery mode while going up a mountain. 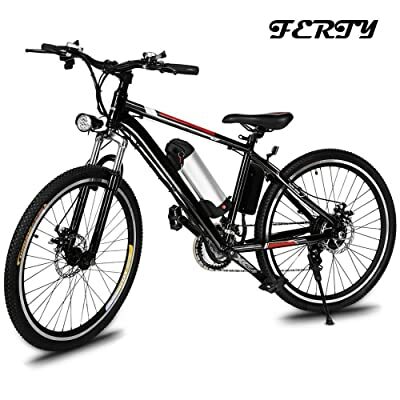 The Ferty e-bike is constructed for mountainous areas. It is designed and constructed with different materials for the different parts of the bike. The frame is 100% aluminum alloy, which makes it lightweight and the fork is made of carbon steel. Moreover, the wheels are made of double layers of aluminum. This e-bike also contains a 3-mode speed button that is placed on the gear. This bicycle is designed to give comfort while riding and make it easier to climb up the mountains with the e-bike. The handlebars and seat are very comfortable and the seat is adjustable. Equipment like the LED front light helps in safety aspect. Similar to many e-bikes, this one also has two working modes where one can choose between electric and partially assisted. This new electric bike has a lot of amazing features like the lithium-ion battery, it makes the ride long and easy. The estimated distance this e-bike can do with a fully charged battery can cover 35 to 60 km. The seat can be adjusted to 30.4 to 39 inches according to your comfort. The lithium battery is 36 volts and acts as a smart battery. The whole structure is lightweight and easy to ride. The manufacturer has taken care to put safety features on this e-bike. It gives speed options that lets one select the right speed for the road. One can also switch between self-pedaling with a little assistance of electric force and from fully electric control. The battery can overheat with usage. Electric bikes are a great alternative source of transportation. They save energy and protect the environment by reducing the use of fossil fuels. The bike has a 750W motor that gives it great power so that you can expend less energy while riding. The bike features a 48V Lithium battery that is removable and can be charged separately. The bike provides great speeds at the smallest amount of effort. The EGO electric bike provides a maximum speed of 25mph. The bike can run for up to 25 miles on electric power. The bike further features a power display on an LED panel and it even has cruise control. The maximum speed can also be set on the bike so that you don’t go over the local speed limits. The electric bike has a very ergonomic design that has an adjustable seat. The tires of the bike have great traction and are anti-slip. 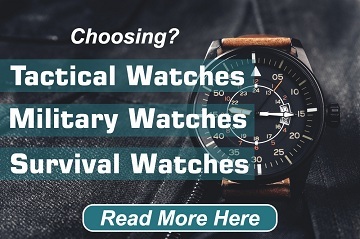 They are also wear-resistant and last for a long time. Up to 90% pre-assembled and very easy to set up. You can set the speed limits according to your preferences. It can run for 25 miles at 25 mph on electric power. Tires are anti-slip and wear-resistant. An environmentally friendly solution for transportation. The grip of the tire is slightly loose. This electric bike is best suited for teenagers and adults. It features a removable lithium battery that can be removed from the bike and can be charged separately. This mountain bike has an aluminum alloy frame that adds to its strength and durability. It is available in black that gives it a very classy and timeless appearance. The Dtemple electric bike is not too large with its 25” size. The bike weighs about 20 kg and provides a great mileage of 35-70 km and can run at a maximum speed of 25-35 km/h. This mountain bike can carry a maximum load of up to 150kg. The front-fork of the bike has been made using high carbon steel that gives it great strength and comfort. It has even been designed to absorb shocks so that you have a pleasant and comfortable ride. The battery on the bike has a charging time of about 4-6 hours. The bike also features front and rear disk brakes and aluminum alloy pedals. The bike also has a bright LED headlight and horn. This means that you can safely ride it in slightly crowded areas and at night. The gear-shift system makes for a safe and comfortable journey. This bike even has a 21-speed transmission system. This bike is perfectly suited for rough terrain. Shock-absorption technology makes every ride comfortable. It is very easy to setup and ride. Best for teenagers and adults. Needs to be fully charged to provide great riding time and speed. Choosing the best electric mountain bike can be a hassle. Our guide will help you make a checklist of the things that are important to consider when you choose one. The weight of an electric bike is a little different than a regular mountain bikes, and matters in different ways. A regular bike weighs about 30 lbs., the e-bike ideally weighs about 50 lbs. The motor, battery, and other electronic features take up the weight but they are more likely to back the weight up with their work. You can get e-bikes weighing from 38 to about 70 pounds. However, the ideal ones are the ones that weigh about 44 pounds. Keep in mind that if you do not opt to use the motor of the bike, the weight will instantly start to feel more than usual. 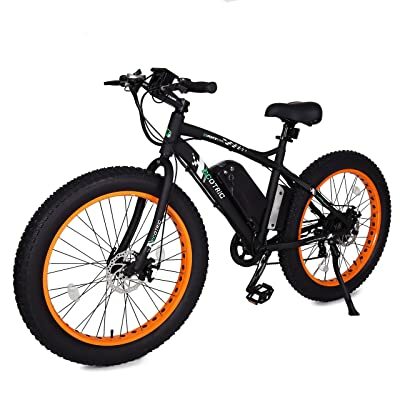 You will see that most of the electric mountain bikes have wide tires. Wide tires are highly recommended. They provide better traction on even the roughest terrains, and help in increasing stability, and are more durable. The 2.5 inches to 2.8 inches tires are considered to be the perfect width. This diameter may be different from regular bikes, but with the motor and other components, the tires will need the width to accommodate all the features of the e-bike. Rechargeable batteries or the lithium-ion batteries have easily taken up about 90% of the market of the e-bikes. These batteries are easy to carry and are easy to handle. These batteries last longer and provide more power to weight ratio for a smoother ride. However, they can be a little hard to handle in some aspects. It is not easy to carry an extra one without being held down by the weight. They take about 6 to 8 hours to completely charge, and depending on the company, they can shut down without any reason. You will need to make sure your e-bike has a good warranty on the battery. 4. How Much Suspension Travel Does an Electric Mountain Bike Need? 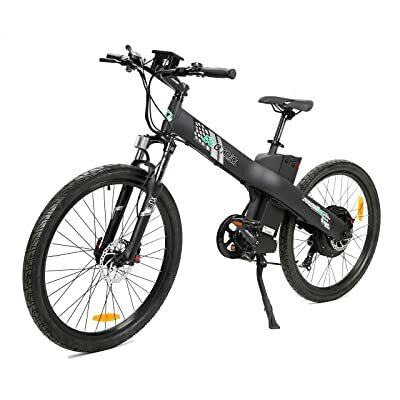 The suspension travel of the bike depends on the usage of the electric mountain bike. The suspension system helps provide the rider comfort while riding and improves the traction by ensuring that the wheels remain on the ground on rough terrain. If you opt for a three-inch suspension travel then you might not want to use your bike in rough terrain. You can generally ride very mild rough terrains with this system. The four inches of suspension travel is perfect for trails that are smoother yet a little steep. Five inches of suspension travel is the most suitable since it helps with riding on the steep and rough terrain. They help in keeping the bike on the level. You will find 6 and 7-inch travel suspensions but they are mostly for professionals that are riding on very steep – almost vertical terrains. These additionally need more than just the suspension travel, but a heavier e-bike as well. Carbon frames are much lighter than other material frames on e-mountain bikes. This factor may be huge in regular mountain bikes, but on e-bikes, it doesn’t really matter. Carbon, in fact, proves to be a better fit to e-bikes. It allows the frame to be optimized freely and helps the bike to be stiffer. Carbon also helps in a smoother transition of the e-bike by providing a smoother foundation for the battery and the motor of the bike. However, carbon also is a bad conductor of heat and electricity. This feature of carbon allows heat to be collected more in the system when the motor is running. Hence, carbon makes sense but only for making the bike look good. The motor of the e-bike does not stand independently but still holds a lot of importance. The stronger the motor is, the more it will consume electricity and the less time the battery will have. The factors to be considered are the weight, battery, terrain, suspension, and frame of the motor. Of course, the motor is like the brain on the e-bike, it helps the entire bike run. 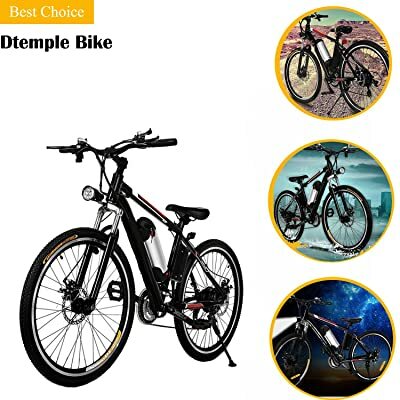 You will find that electric mountain bikes have many different prices but getting one for thousands of dollars is not very smart if you are not going to be using it that often. Similar to the other products in the world, the price of the bike does not necessarily make it a better performer. You will need to decide your budget and then your needs and see if you can find something close to what you want. Electric mountain bikes are the sports cars for bikes. You should only get them if you have money to spare or you need them for a special purpose. Our article helps you find the best electric mountain bikes in 2019 and gives unbiased product reviews with a professional understanding of each of them. Combined with our buying guide, you can understand the important aspects of the e-bike since companies tend to make their product stand out with various luxury features that make the product expensive.